Let's see how well Bremer and the CPA did in the months after Baghdad was occupied. 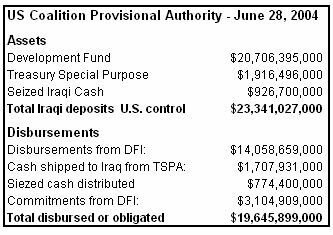 Of the $19.5 billion disbursed in Iraq in just over a year after the invasion, $12 billion came from the New York Federal Reserve board in cash. This consisted of $1, $5, and $10 denominations to start and shifted to $100's over time. One shipment consisted of $3 billion in cash. The pallets holding the cash weighted nearly a ton. In order to keep track of this type of money, a top notch accounting system is required. The CPA didn't like their first accounting firm. Instead, they hired a very small firm, North Star Consultants, Inc. out of San Diego, which apparently was located in a suburban residence. The $1.4 million contract with North Star didn't go far. There were no internal controls within CPA to handle this money, none, according to congressional testimony. So to answer the question, "How well did the United States do in handling all this, we'd have to say, "Who knows?" KPMG was the required external auditing firm. It found and reported problems but little, if anything, was done. Of the $19.6 billion disbursed, much of the money supposedly went to salaries. Some of these were for what was described as "ghost" employees. Substantial funds went to Iraqi government agencies but there were no controls to track the money. A whopping $8.8 billion was never accounted for, even by the generous standards employed in tracking money. It simply disappeared without a trace. 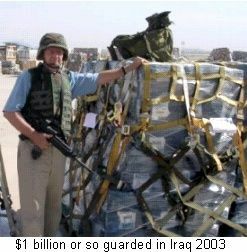 The direct costs of Iraq appear below. There are higher estimates that include the post war costs of caring for all those injured and opportunity costs. But this will do. The $8.8 billion lost in the initial phases of the occupation is just a sample of a much wider problem. We'll have a much larger overall fraud rate at some point. But it will be too late. A job once well done is twice done. We'll be doing the accounting job forever on Iraq but we'll never see a dime of the money return to the Treasury. Mission accomplished for the greedy criminals who stole this money and much more out of other programs. Oliver: I have no idea. I can’t tell you whether or not the money went to the right things or didn’t — nor do I actually think it’s important. We don't need any more stories from AP that recycle the same old problems over and over again. The waste and fraud were there from the start. It was well known and nothing was done about it. We'd be better off with investigators arresting thieves and special prosecutors trying them. But that won't happen either. We are truly at the end of the long road of public lying to enrich the financial elite in their most profitable enterprise - war. We can't fund their avarice anymore. It's over. United States' Involvement in Iraq Reconstruction, United States House Oversight and Government Reform Committee, Feb. 6, 2007. This article may be reproduced in whole or part with attribution of authorship and a link to this web site. and then this. How many incidents do we have of our money, our tax money, being thrown away, sent overseas, corruption and waste? This is something those "tea party" people have a point on and I can see why they would just say "smaller government" for when you see the government just handing over your money to super rich banksters, or corruption and stuff like this, who cannot get angry? It's not an issue of "big" vs. "small" government to me, it's this, just not acting in the national interest or using public funds for the public good. What a concept? Vietnam, Gulf War I, and Gulf War II were not in our national interest. Vietnam and II ruined the economy in the aggregate. But the elite made out like bandits. Add the oil and currency manipulations in the 70's that killed off industrial growth and you have a planned method to enrich financial speculation. No wonder we're screwed. The real cost of Iraq will be about $2.5 trillion according to Joseph Stiglitz. Time to round up some crooks, take the money back, and give them some time to reflect. Early on after the invasion, there were reports of a semi trailer filled with I believe ten billion dollars that mysteriously vanished. It was news for about a week then it disappeared as well, I've never heard another peep about the money if it were found (yeah right)or not. My guess is that it found it's way into the bank accounts of the original conspirators.